Republished from: SAID-MOORHOUSE, Lauren. Italy’s voters choose populists, deliver stinging rebuke to Europe. CNN, 05.03.2018. 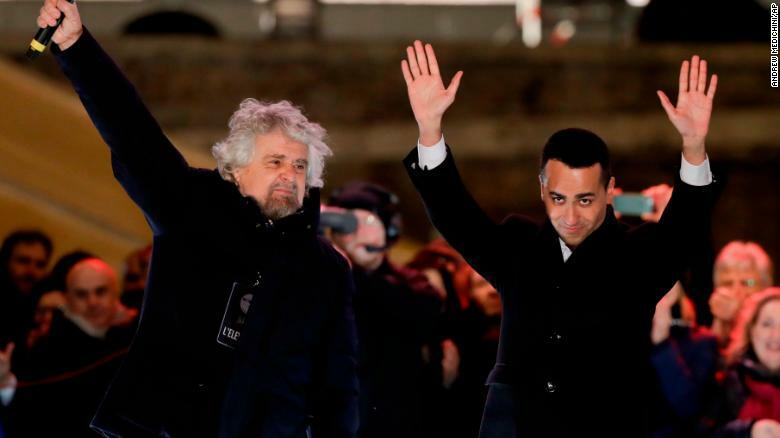 (CNN) Italy was plunged into political uncertainty Monday after parliamentary elections delivered victories for populist, euroskeptic parties but left no clear path forward for a new government. No party or coalition received enough votes to rule alone, and Italy now faces a hung parliament, in what European Commission chief Jean-Claude Juncker described last month as the “worst-case scenario” for Europe. With nearly all votes counted Monday night, 50% of voters showed support for populist or right-wing parties. The anti-establishment Five Star Movement (M5S) become the largest single party in parliament with roughly 32.7% of the vote, according to Italy’s Interior Ministry, although it will not have enough seats for an outright majority. A right-wing coalition of parties won the most seats of any bloc in parliament with about 37% of the vote. The big winner in that group was the anti-immigrant and xenophobic League — formerly the Northern League — which garnered more votes than the center-right Forza Italia, its potential coalition partner. The right-wing coalition cobbled together by Silvio Berlusconi won the most combined votes at 37%, but the League came out on top of the bloc, winning roughly 17.4% of the votes to Forza Italia’s 14%. The swing toward the League, led by Matteo Salvini, looks set to give the party as many as 123 seats in the lower house, up from 22 seats, an almost six-fold increase. With around 32.7% of the vote, M5S outperformed final opinion polls. The party dominated in the south of Italy, receiving almost one in two votes in a region where youth unemployment is historically high. Italy’s center-left coalition had a bad night, mustering about 23% of the vote. It is likely to end up as the third-largest group in parliament behind the right-wing coalition and M5S. Former Prime Minister and Democratic Party leader Matteo Renzi stepped down from his role after it suffered a worse than expected performance. 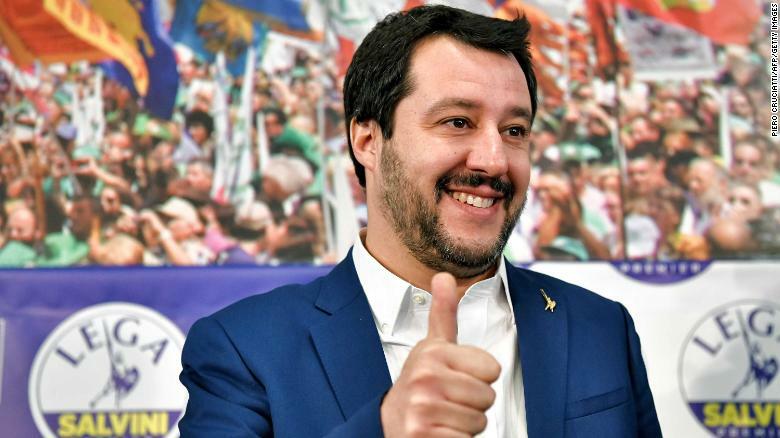 As the results continued to be counted earlier in the day, the League’s Salvini claimed victory during a press conference in Rome on Monday morning that will have set alarm bills ringing at European Union headquarters in Brussels. “We look towards the other European forces, that they call populist. I am and I will stay proudly populist, because the populists listen to the people, unlike the ‘radical chic’ that despise the workers and don’t do their groceries, ” Salvini said. Italians have becoming increasingly frustrated after years of unprecedented migration and continued economic woes. 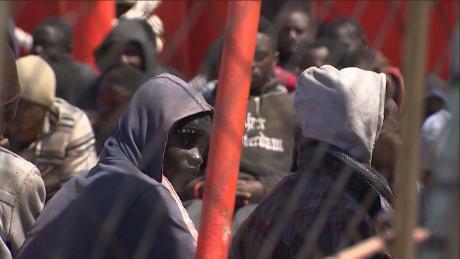 Seizing on this dissatisfaction, right-wing parties had touted an anti-immigration agenda, with the League pledging to put “Italians first” and advocating for mass expulsions. “The big and only winners of the night are the Five Star Movement and the Lega (the League),” Chiocchetti, fellow of the Robert Schuman Institute of European Affairs at the University of Luxembourg, told CNN. The Five Star Movement had campaigned for a universal basic income, a measure especially popular in the south, where the unemployment rate, at almost 20%, is more than three times as high as in the north, according to the Italian National Bureau of Statistics (ISTAT). It appears this was a winning strategy as early projections indicated M5S had dominated the region. Minutes after Salvini spoke, rival party leader Luigi Di Maio claimed M5S were the “absolute winners of the election,” before adding that the party was “open to talks with other parties” to form a government. “Other coalitions have no numbers to govern… So we take this responsibility,” Di Maio said. Although the PD is projected to have won second-most votes at about 18.7%, its center-left coalition, formed with the liberal More Europe party, could muster just short of a combined 23% and will likely end up as the third-largest group in parliament behind the right-wing coalition and M5S. PD Leader Matteo Renzi stepped down from his role after it suffered a worse than expected performance. Speaking at a press conference on Monday, Renzi said that the party’s place in government is now in opposition. The rise of anti-European voices, both on the right and from the anti-establishment M5S, comes as Italians appear increasingly divided over issues such as undocumented immigration, which contributed to a rancorous campaign. Italy is one of the main entry points into Europe for migrants from Africa, the Middle East and Asia. “This election is crucial for the global populist movement,” he said, adding that it was an issue of “sovereignty” for Italians opposed to immigration. CNN’s Lorenzo D’Agostino, Gianluca Mezzofiore and Kara Fox contributed to this report.